Hello there Mr. Dan. I stumbled across your site whilst googling "can you get hurt making a potato battery". Yep, I googled that. In planning my son's birthday party, I am considering a potato battery station (sounds odd for a party, but trust me, it fits with the theme). I have seen several Youtube videos with instructions and examples, some done by children. My main question before I go buy a bag o potatoes and seek out the copper wiring aisle of Walmart is: Can children be hurt doing this? Yes, us grown-up types will be there too, but is there anything I should be concerned about? It is theoretically possible to kill yourself with potato batteries, but the chance of a kid managing to achieve this is much, much lower than the chance that one of them will fall over and crack his/her skull in your bathroom, and you probably won't lie awake at night worrying about that. I could just leave it at that, but of course I won't. This is because I think an understanding of the basics of electrochemistry, which is what potato batteries are all about, is something that all modern humans should have, even if they never put it to use. You should know why it's warmer in the summer (it's surprising how many people incorrectly say "because then we're closer to the sun", which, even if it were true, would make summer happen at the same time for both the northern and southern hemispheres...), you should know how tax brackets work, and you should also know the basics of the technology that envelops modern humans so completely that we hardly notice it at all. Sorry, didn't mean to lecture you. This is just something I'm rather passionate about. 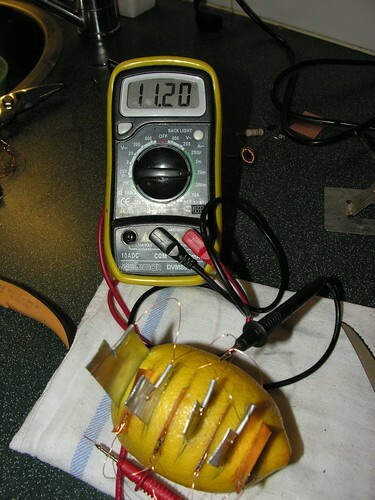 Getting back to potato batteries: The power output of an individual potato, or lemon, or what-have-you, "battery" is extremely low, which is why there are few-to-no things you can power from one spud with two pieces of dissimilar metal in it. The open-circuit voltage of any electrochemical cell is determined by the electrode potential of the materials you use for the electrodes. If you build the usual kind of potato battery with copper and zinc electrodes (like, a copper or copper-plated coin, and a zinc-plated galvanised nail), each cell will have an open-circuit voltage of 1.1V, but a current capacity into a short circuit of less than a milliamp. The larger the surface area of the electrodes, the higher the current capacity will be. But even with really big electrodes you'll probably only get half a milliamp into a short circuit - and the more of the cell's current capacity you use, the lower its output voltage will be. If you make multiple potato batteries and put them in series and/or parallel, you can increase the voltage and/or current capacity of the whole battery, respectively. Two cells in series (both of which can be stabbed into the same potato; just connect the copper of one cell to the zinc of the next) and you get 2.2 volts open circuit and the same miserably tiny current capacity. Two cells in parallel, and you get 1.1 volts but double the current capacity. Six cells, wired up as series strings of three with the two strings in parallel with each other, and you get 3.3 volts and double current capacity. And so on. Getting back to your actual question, this is how you could, if you tried very hard, kill yourself with a potato battery. 30 milliamps across the heart has a pretty good chance of stopping it, and even lower currents have upon occasion been fatal. Kids might be more susceptible, too; I don't know. Even sweaty skin is a good enough insulator that sundry low-voltage current sources aren't dangerous - grab the terminals of a 12V car battery with bare wet hands and you probably won't even feel a tingle, though a tiny current really will be flowing through your arms and across your chest. But if you stab probes into yourself, into your hands or preferably into your chest right on either side of the heart, then an array of potato batteries big enough to deliver tens of milliamps really could, if connected to the electrodes, kill you. Given, of course, that this particular means of death starts out with stabbing yourself, you could simplify the process by just stabbing your heart directly. Hence: Not worth worrying about. The great problem with potato-battery demonstrations in the past was not, of course, kids somehow killing themselves, but that it was very difficult to do anything with the extremely feeble output of such a battery. Turning even a tiny motor, or lighting even a grain-of-wheat incandescent bulb, was impossible without a ridiculous number of cells. Getting a feeble glow from a grain-of-wheat bulb rated for 12 volts and 80 milliamps could perhaps be done with as few as 50 potato cells, though I suspect you'd need a hundred or more. So potato batteries usually ended up doing something lame like powering a pocket transistor radio with a piezoelectric earpiece, which is a feat that you can more impressively achieve with no battery at all. Today, you could similarly fail to impress the youngsters by potato-powering one of those little LCD clocks and kitchen timers that're meant to run from a couple of button cells. Two or three potato cells in series might, at a stretch, be able to run one of those. 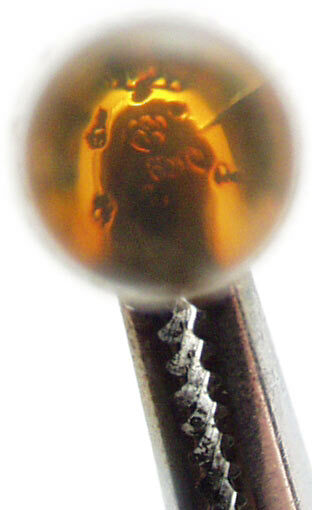 A far better target, though, is lighting a light-emitting diode (LED). 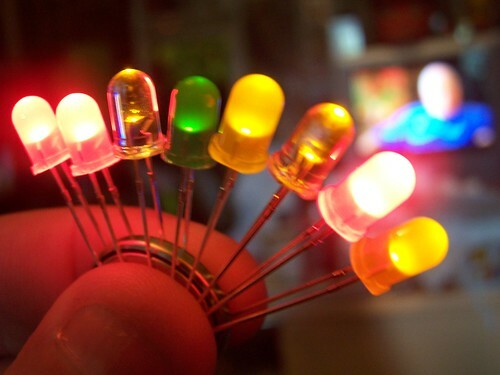 A modern high-intensity red or amber LED will only want about two volts and a couple of milliamps to light dimly, and will be quite impressively bright at only 10mA. Ten parallel strings each containing two potato cells ought to be enough to give a pretty bright light, and each two-cell "string" could be only one potato. ...which works extremely well because it's cheating, and using a simple four-component circuit (counting the LED) called a "Joule Thief", which I learned about years ago on the excellent Web site of the inimitable Big Clive. 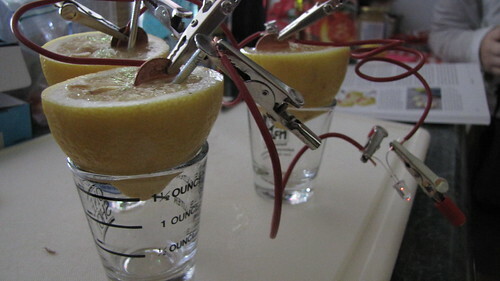 I recommend you provide sufficient spuds and/or lemons, electrodes and alligator-clip leads to make lots of cells, and also provide a grab-bag of water-clear high-intensity LEDs so the kids don't know what colour they've got until they get it to light up. 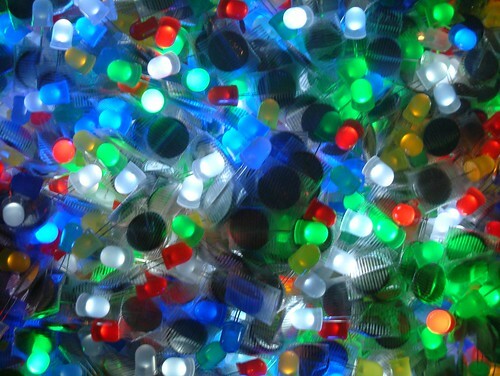 A lot of LEDs will not cost you a lot of money. I find it mind-blowing that the going price on eBay for a pack of a hundred mixed waterclear high-intensity LEDs has, for some time now, been under five US bucks, delivered. I suggest you get 5mm LEDs, not the 3mm ones that're the absolute cheapest, because the smaller ones are a bit fiddly even for kids' hands. While you're shopping for quantum-physics miracles on eBay for three cents each, you could add a couple more things that used to be super-tech and are now super-cheap: Lithium coin cells, and rare-earth magnets. 2016 (20mm diameter, 1.6mm thickness) and 2032 (3.2mm thick) coin cells aren't as cheap as LEDs; if you buy them in a supermarket or pharmacy you can pay dollars for one. Again, though, just hit eBay and you can find fifty for less than 15 US cents each. Rare-earth magnets can be even cheaper. If you restrict this search to Buy It Now items more suited to the impatient, you can get twenty 8mm-diameter 1mm-thickness neodymium-iron-boron disks for less than ten cents each; hundred-packs drop it to about seven cents apiece. Why am I suggesting you buy these items? Which are easy to make, and awesome. I'm curious about the physics of creating multiple cells with a single piece of fruit. How is it that the cells compose in series. It seems that all of the zinc would behave as a single terminal and all of the copper would behave as a single terminal (thus you'd just get a parallel composition). Similarly, how is parallel composition different from just using bigger metal plates (with more surface area)? When you have the plates as shown in the two s8 lemon batteries, each anode / cathode shields the two cathodes / anodes either side of it. In this case, the cathodes (zinc) are more positive than the adjacent anodes (copper), and shorting the "reversed" cells creates a forward voltage that is the sum of the individual "forward" cells. That voltage will be slightly depressed due to the imcomplete shielding offered by the plates. 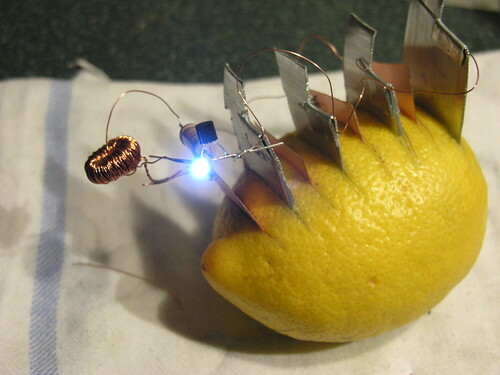 If you just insert copper nails and galvanized nails into the lemon like a pin-cushion, making sure not to let them touch, and take unconnected copper/zinc pairs and connect the two nails together in each pair until you have one unconnected terminal pair of nails left, then the arrangement will greatly affect what voltage you get from the two terminal nails. Arrgh. Got my terminals mixed up. The Zinc is the anode, and the copper is the cathode, not the other way around. You'd be surprised (and saddened) to discover how many people in the northern hemisphere don't actually realise that summer doesn't happen at the same time all over the globe. I used to answer calls overnight from potential tourists(Mostly US callers) for Tourism New Zealand. Hi, I'm flying to NZ in a couple days. What's the weather like so I can know what to pack? Here in Wellington at the moment it's the middle of the night and about 35° F, forecast for tomorrow is for a high in the low 50s. Yeah, that's about average for the middle of winter. Protip: Check the weather BEFORE spending thousands on airfare. I just went to look at the prices of leds and saw an auction for led lit balloons then thought...What if you put throwies INTO a helium balloon? Use a smaller battery, maybe a smaller led, I bet it would only weight 2-3 grams. Practically nothing. Choosing a cafe, restaurant or barber! Any establishment with a $49 LED sign connected to a wall plug by a taut diagonal wire is probably not as good as next door who has a neon sign, or even no sign. Use diffuse LEDs! DIFFUSE ONES! Don't use the ones with a 5-degree viewing angle that light up the other side of the street at night and make passers-by think they're being interrogated by a Cardassian! Do the diffuse ones cost ten cents more per blindingly-bright sign, or something? Jesus! Re: "Many people seem to find the concept of series and parallel circuits tricky to grasp"
I smiled when I read that, because I only learned it myself three months ago, and yes, it had flummoxed me for years. The *reason* it confused me is both amusing and stupid, and I may as well tell you, just for laughs. I've been repairing electronics in a half-baked way for years; you know, clean the switch, resolder a wire that came loose, replace the headphone cord. But it bothered me that I didn't know what I was doing, so after a few years I got some books, cracked them open, and immediately got stuck on the serial vs. parallel circuit concept. Parallel made sense to me, but serial definitely didn't. See, for years I'd been looking at simple circuit diagrams, with the red-colored "+" wires and the black "-" wires, and I'd somehow concluded that this meant that the wires were carrying positively-charged and negatively-charged electricity. I know, I know. I wonder if you have the same look on your face that my Dad did when I told him that. Sort of an "Ebbeh?" expression. Well, I thought the + and - legs were sort of like the way oxygenated and oxygen-depleted blood moves around a circulatory system, or...something? Actually I just didn't think about it at all! I know that ATOMS can't move through electrical wires, not ions and certainly not a bunch of lone protons running around. It was just one of those dumb ideas that get stuck in your head! ...and I'm thinking, "OK, so the positively-charged electricity comes out of the battery, goes into the first light bulb, comes out *negative*, that's fine; but halfway between Light Bulb 1 and Light Bulb 2 it becomes positive again? The hell?" And I would set the book aside, thinking that this stuff must be beyond me. But a few months ago I decided to tackle electronics again, and lucked across a book that made it very clear, that the + and - in a circuit have nothing to do with charge, but just a sort of push and pull. It was one of those moments where you want to simultaneously laugh and throw something breakable! If only someone had armed you with the water-flow analogy when you were a kid! Those are such wonderfully clear analogies! This is why I love reading your site; you take foggy concepts (foggy to me, anyway) and translate them into something that I can understand. Thanks for the encouragement over the years--you've provided me more of that than you could ever know. Particularly when I look at some of your LED projects. 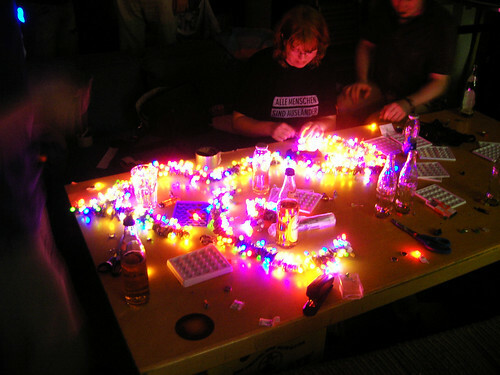 I won't rest until I've built that oscillating multicolored case-light thingy--that was just too cool! So if I was to get a potato and insert a copper electrode directly opposite a zinc one, then twist wires to each electrode and apply mains voltage, would that light LEDs and be safe for a party? « All I do is drink and wee, I'm gonna live forever!